Are you still alive, my starushka? I am too, and I wanted to write. in the same indescribable light. but I'm causing you pain and distress. in your tattered and old-fashioned dress. heart, someone plunges a Finnish blade. It’s nothing, my dear! So calm yourself. It's only a dream born of dread. before anyone lays me down dead. and return to our own front door. as you did once, eight years ago. don’t rehearse what can never come true. fell to my lot when life was still new. And don’t ask me to pray. Don’t do it! What is long past cannot be made right. You are my indescribable light. don't let me cause you so much distress. 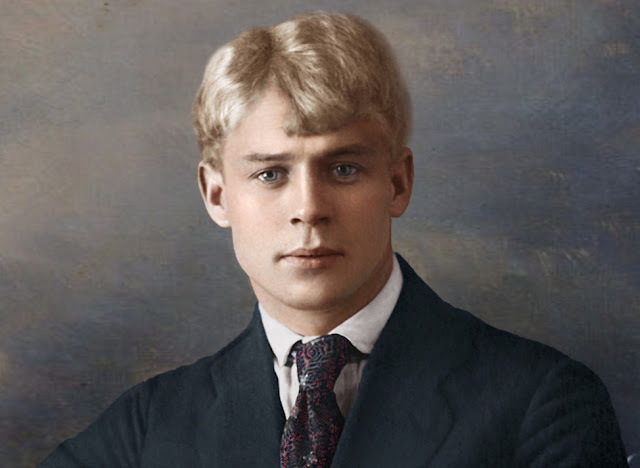 Sergie Yesenin's rapid fame--so disastrous for himself--came just as millions of Russians were moving from the countryside to the cities in the aftermath of the 1917 revolution. His poems of longing for the land and for the families left behind spoke for many. But there was something else: Yesenin had an uncanny ear. His poems can charm you even if you can't understand a word. (Don't miss the performance by Natalya Savchenko that I've linked to below.) They have been irresistible for the generations of Russian songwriters who set them to music. That combination of a theme with broad appeal and extraordinary poetic skills have won Yesenin a popularity in his native country second only to Pushkin's. 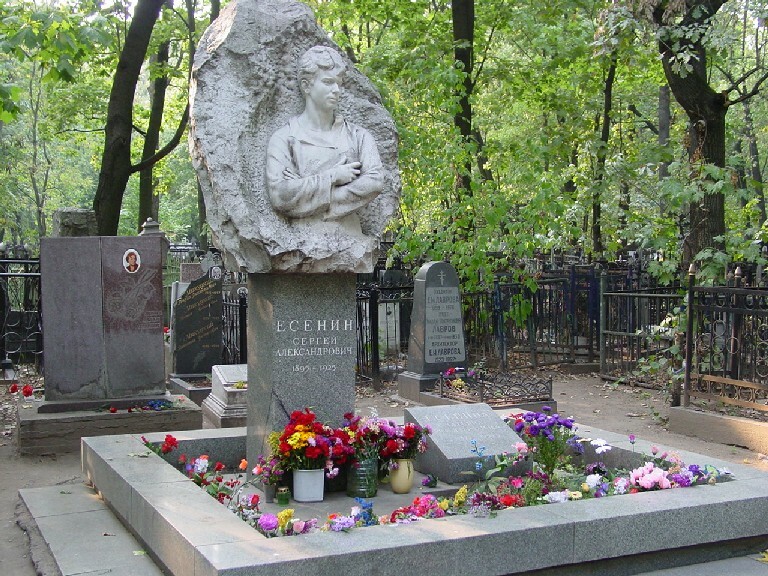 Every day his readers--Russians from every part of society, including retirees who recall when his poems were banned, in Soviet days--bring flowers to his grave in Moscow. Yet Yesenin was one of the people in Russia least suited for the high-profile celebrity thrust on him. Emotionally unbalanced, he suffered from depression and hallucinations, and his main coping mechanism was alcohol. His reputation as a carouser eventually overshadowed his fame as a writer. Increasingly dissolute, he died a few months after this 30th birthday, under circumstances that are still unclear. His chaotic life made headlines at the time, but Yesenin's lyric gift is what makes him beloved today. 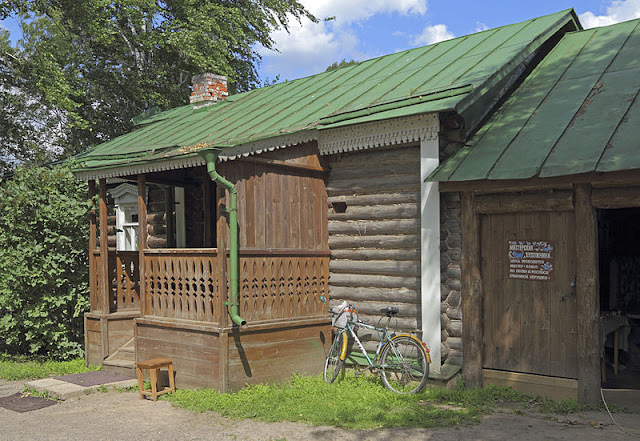 "The most precious thing he conveys," wrote Boris Pasternak, "is an image of nature, of his own Ryazan countryside in the depths of wooded Russia. He was able to describe it, as he saw it in childhood, with an overwhelming freshness."